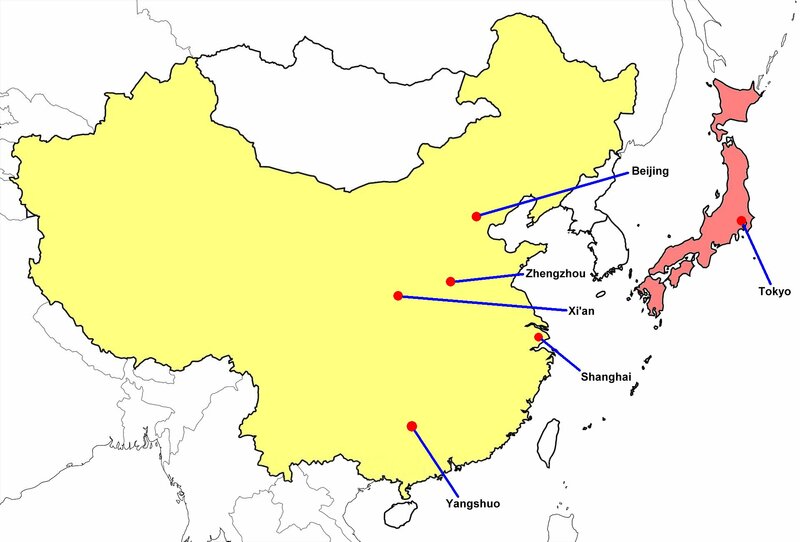 Inter-city travel was via trains and buses, with the exception of a flight from Hong Kong to Tokyo. Here is the view of the street from our hotel window. We were staying in a "budget" hotel, so there wasn't much of a view! 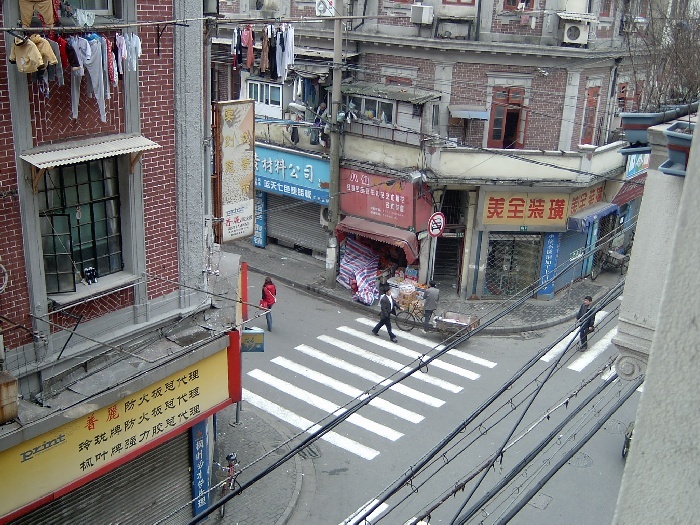 A view of a side street in Shanghai, in the morning as people were on their way to work. 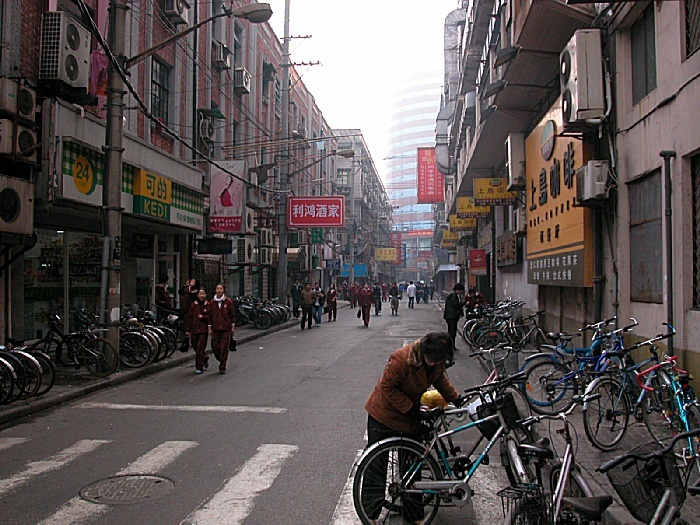 There were a lot of bicycles in use in Shanghai, as many people commuted using this form of transportation. 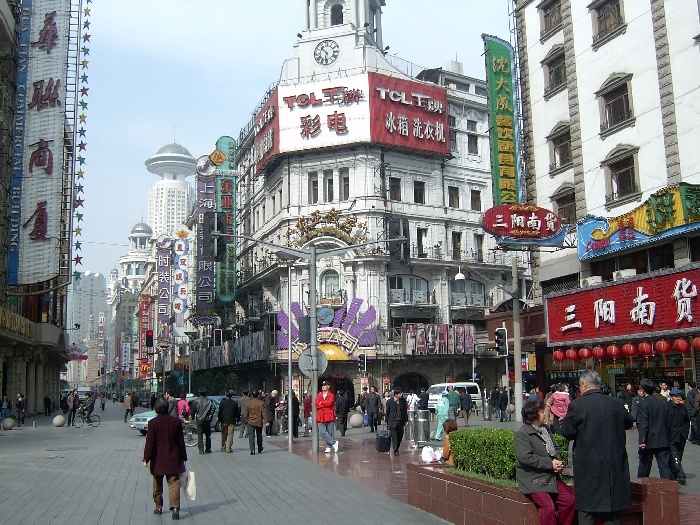 Nanjing Road is a pedestrian only road, as is the main shopping street of Shanghai. 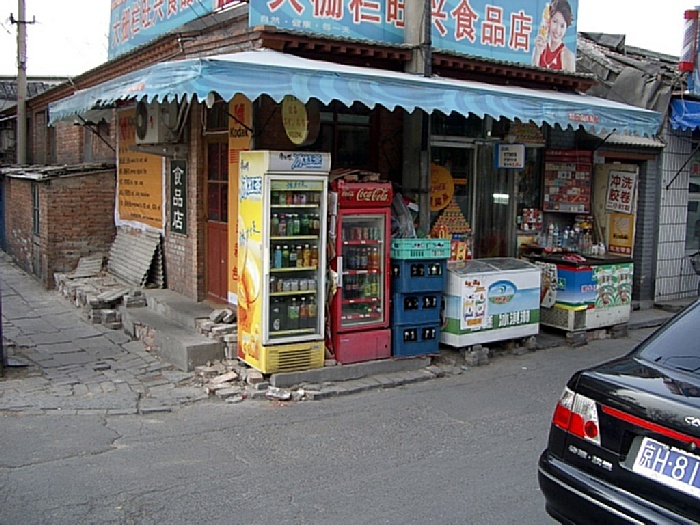 On this street, you will find the name brand designer fashion and accessory stores. 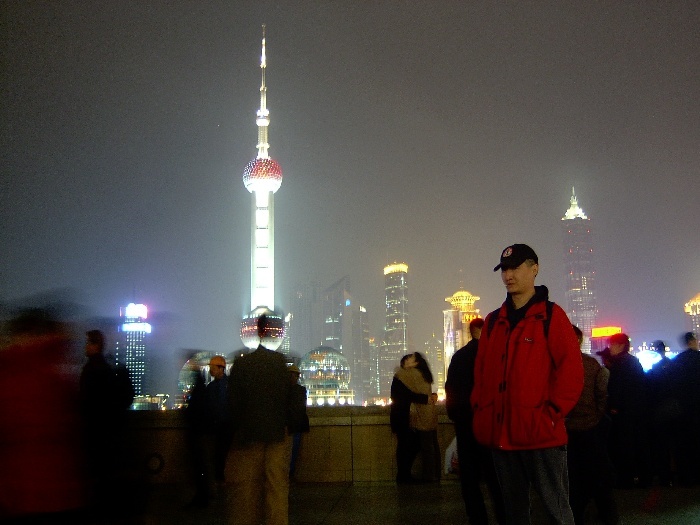 From the Bund, is a view of the iconic Oriental Pearl TV Tower, at night. Construction of the tower was completed in 1994, and is 468 meters high. 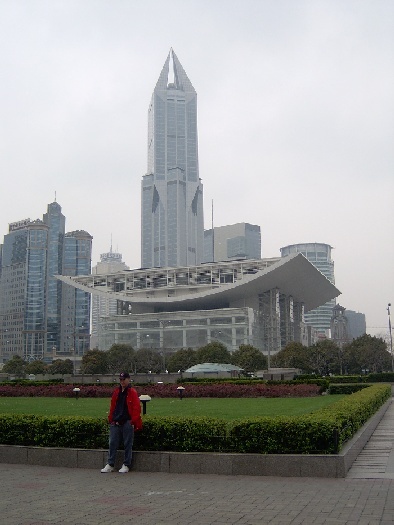 Here I am with the Shanghai Opera House behind me. In the background, the pointy building is the JW Marriott Hotel. 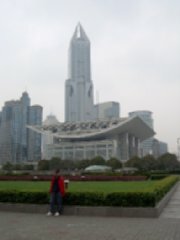 Shanghai is an interesting mix of the old and the new when it comes to the architecture found in the city. 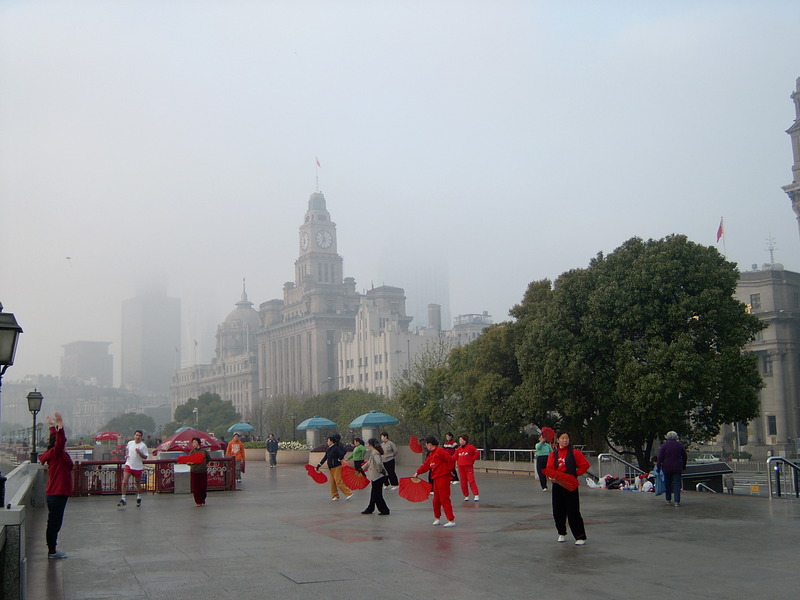 The Bund is a 1.5 km long stretch of waterfront promenade along the Huangpu River. Along The Bund are colonial style buildings from the 1800s. Here on the promenade, Tai Chi is being practiced. 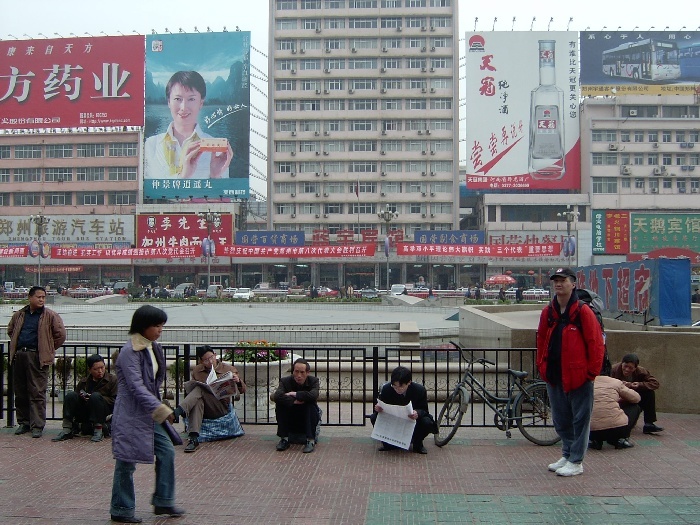 Here I am, outside the Zhengzhou train station, having just arrived in town in the morning. 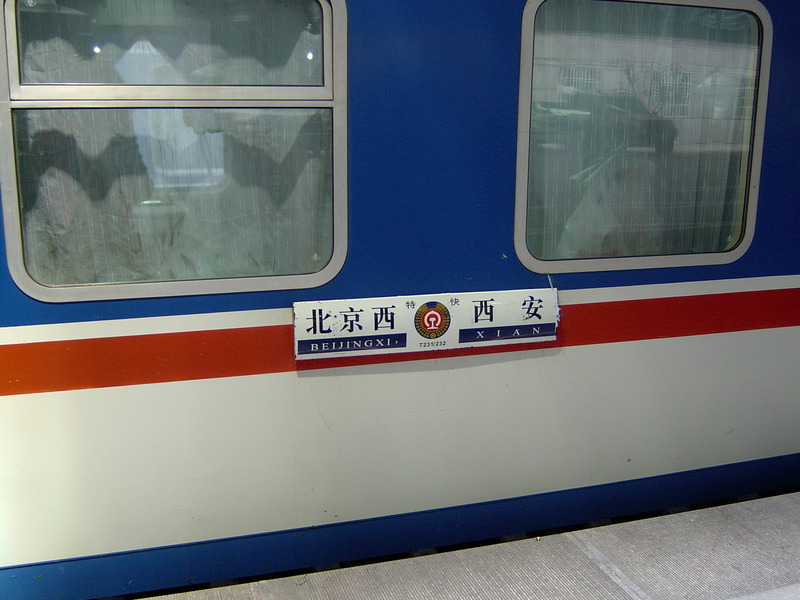 We took the overnight train from Shanghai, booking a "hard sleeper" compartment (versus the "soft sleeper"). Basically, the "hard sleeper" has 6 beds per open compartment, smaller beds, and less privacy than the "soft sleeper'. I thought it was fine. I recommend getting the bottom bunk, as it allows you quick access to roaming around (no climbing). The beds were fine for my 185 cm (6'1") frame. This is the view from our accomodations in Zhengzhou. I was staying in a friend's apartment, in a complex for "foreigners". 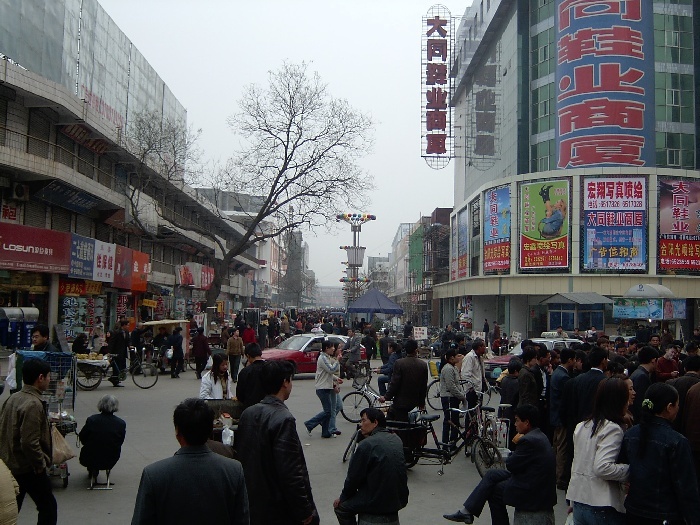 Here is a shopping street in the center of Zhengzhou. 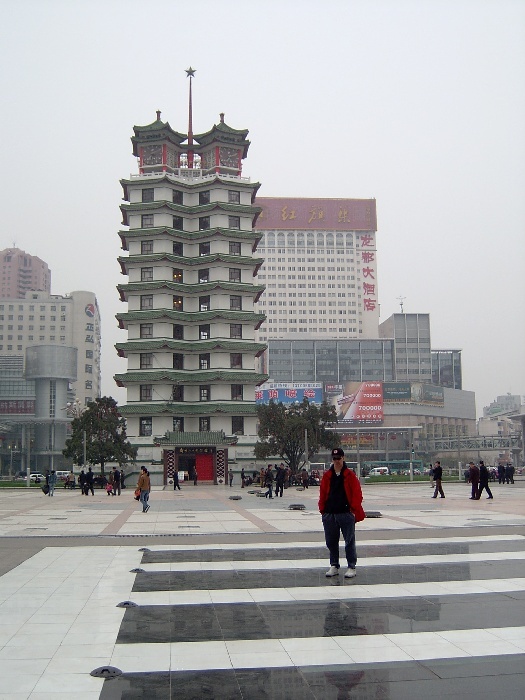 The Erqi Memorial Tower, which is located at the Erqi Square of Zhengzhou, was built in 1971. The tower is a memorial of the Erqi Rail Workers Strike, which occurred on February 7, 1923. The tower has altogether 14 storeys, totaling 63 meters in height. We made a day trip to visit the Shaolin Monastry (少林寺), located in the Song Shan Huang Zhai area. This is better known as the Shaolin Temple to westerners. Here I am at the entrance to the monastry. 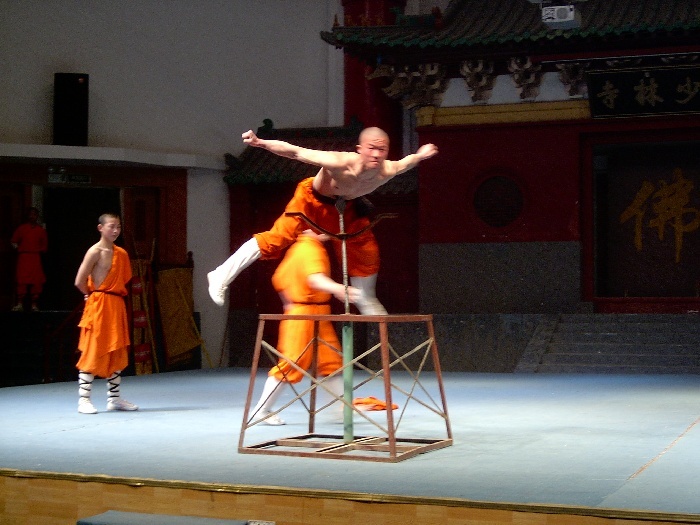 At the Shaolin Monastry, we watched the martial arts show. Here, one of the students demonstrated the strength of his abdominal muscles by balancing on top of a spear. The Pagoda Forest at the Shaolin Monastry. 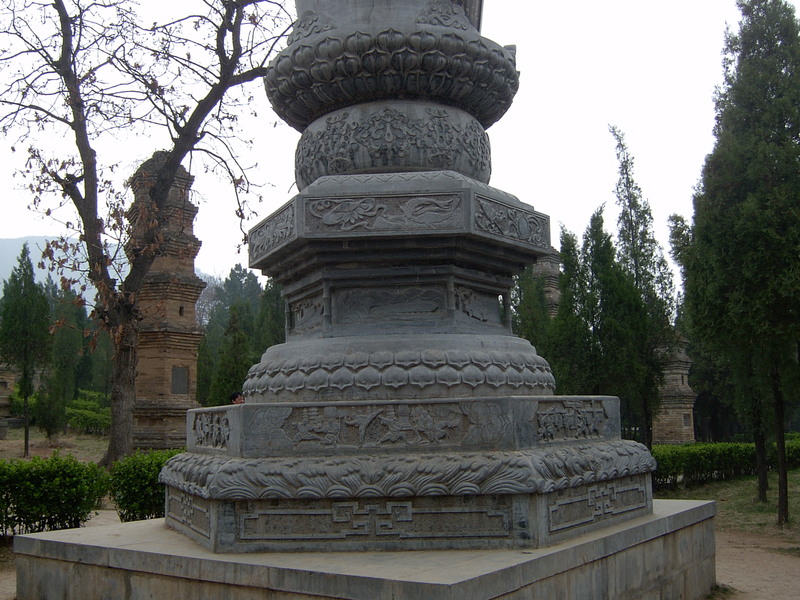 The pagodas, made of brick or stone, was first constructed around 791 AD. These were tomb pagodas for eminent monks, abbots and ranking monks at the temple. 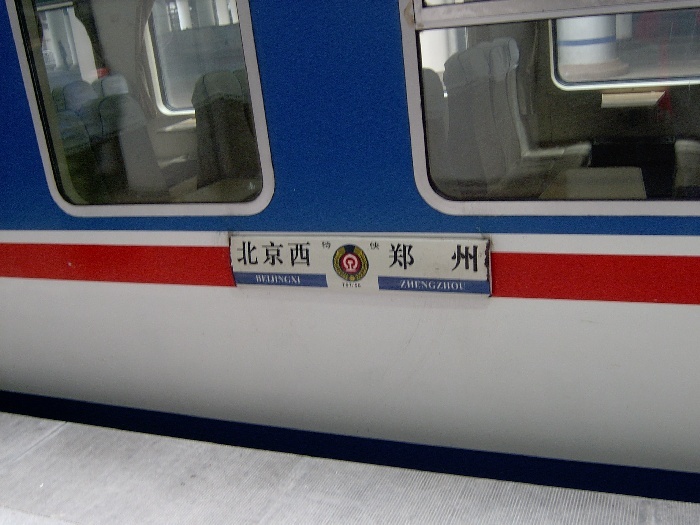 It was time to take the train from Zhengzhou to Beijing. 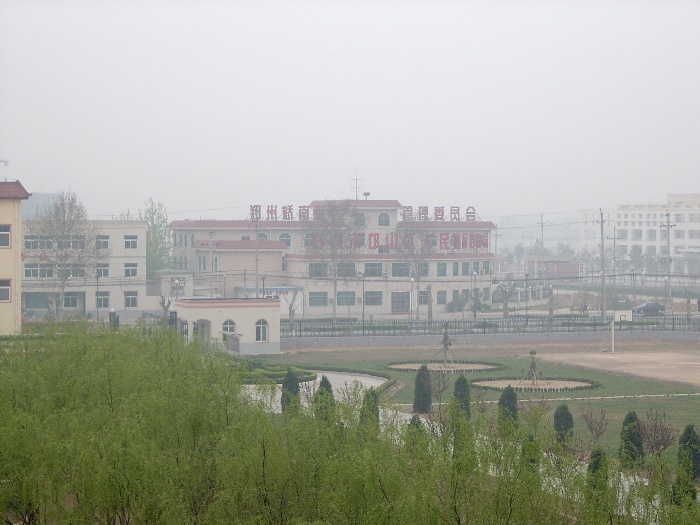 We booked the morning train, so to see the Chinese countryside between Zhengzhou and Beijing. We booked what is known as a "hard seat", versus the "soft seat" option. The "hard seat" tickets are much cheaper and are good for those travelling on a budget. You also get to mingle with the "locals" in this class of travel. 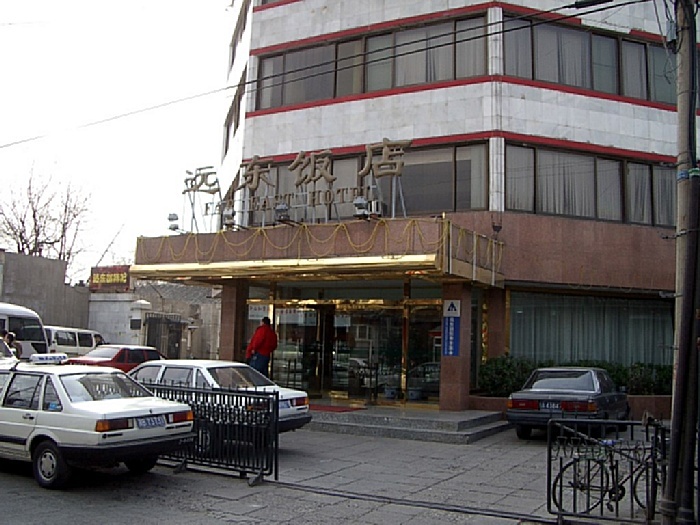 Our accomodations (Far East Hotel) was located in the Beijing hutong, and was difficult to locate. 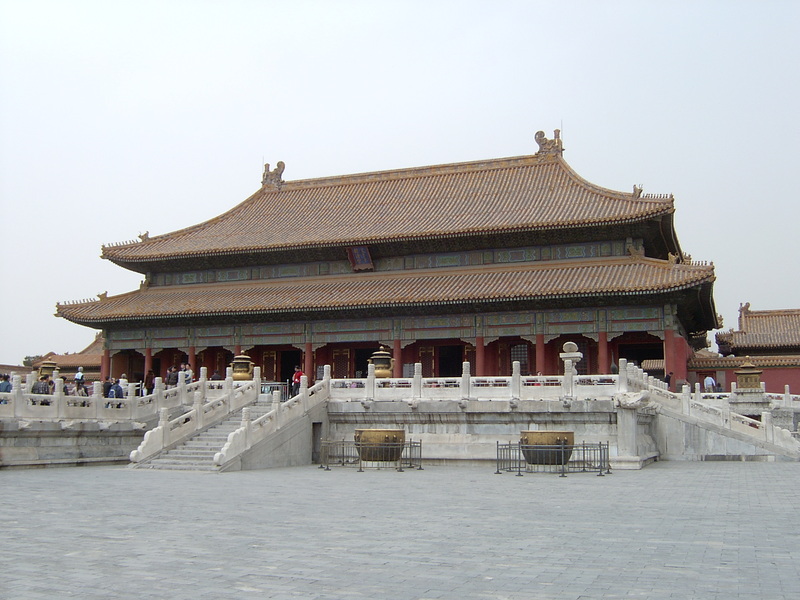 The Forbidden City (紫禁城) is a palace complex in central Beijing, China. 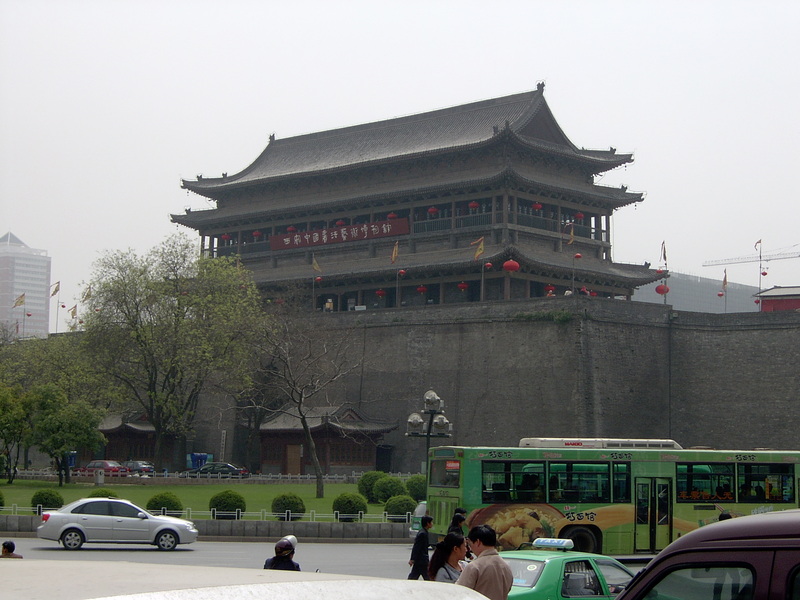 The former Chinese imperial palace from the Ming dynasty to the end of the Qing dynasty (the years 1420 to 1912), it now houses the Palace Museum. 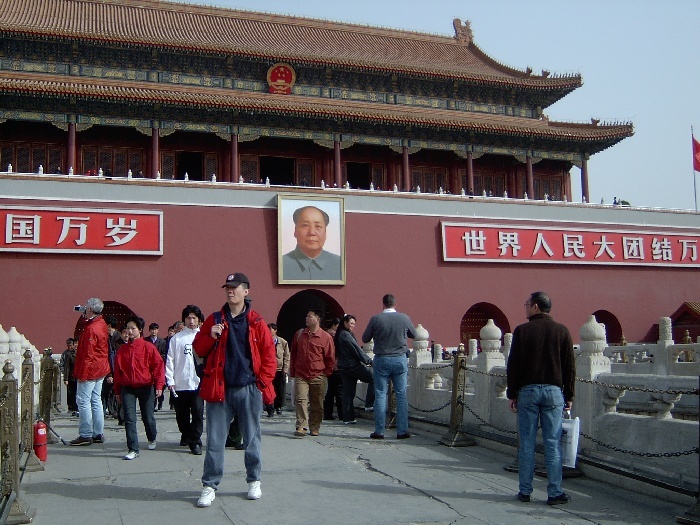 Here I am at the entrance to the Forbidden City, with the iconic portait of Mao. 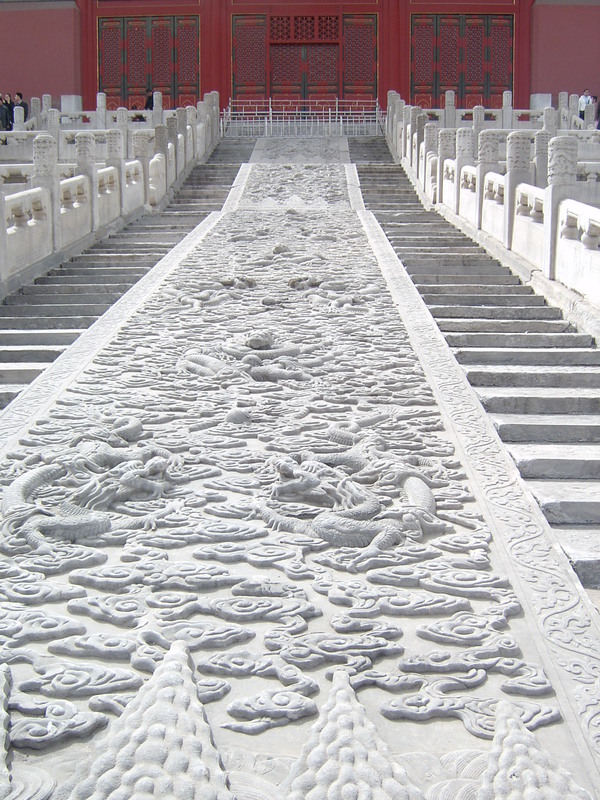 In the Forbidden City, behind the Hall of Preserved Harmony, in the centre of the stairway, is a huge marble relief of nine dragons playing with pearls among clouds. Originally carved during the Ming Dynasty, and recarved in 1761, it is 16.57 meters long, 3.07 meters wide, 1.70 meters thick, and weighs more than 200 toons. 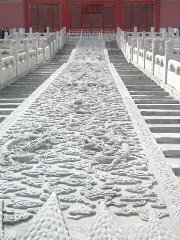 It is the largest stone sculpture in the Forbidden City. 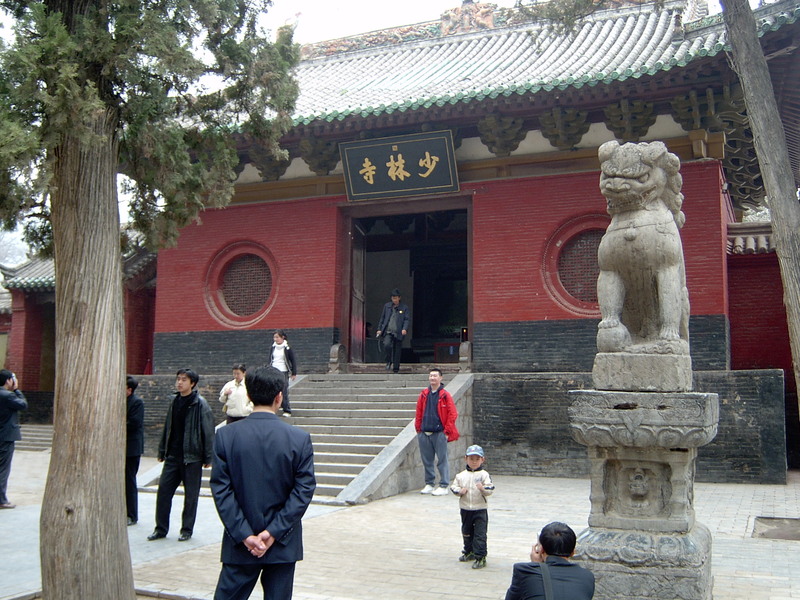 The Palace of Heavenly Purity (乾清宫) was used throughout the Ming Dynasty as the main residence of the emperors. Built in 1420 and rebuilt in 1798 as a consequence of fire damage. The large bronze cisterns in front of the palaces were to store water to be used in fighting fires. 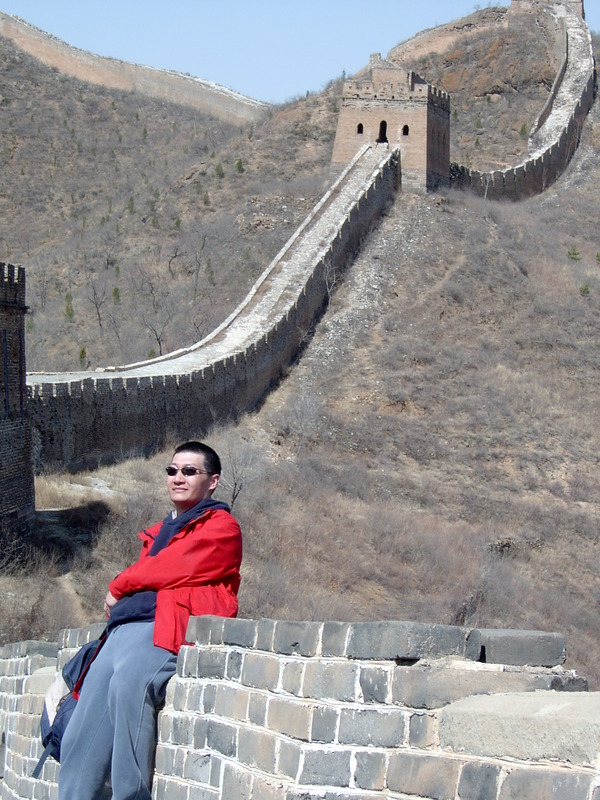 No visit to China would be complete without visiting the Great Wall of China (长城). I visited an unrestored section of the Great Wall at Simatai (司马台), located 120 km northeast of Beijing. This section was originally built during the Northern Qi dynasty (550–577) and rebuilt during the Hongwu Emperor's reign during the Ming dynasty. The view was amazing, with the Great Wall snaking it's way among the mountaintops all the way to the horizon in the distance. Wow! 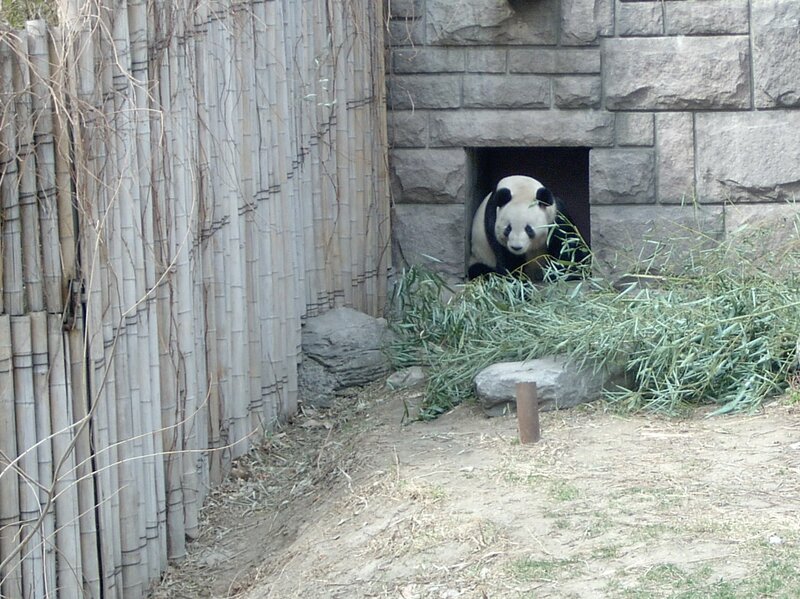 The Beijing Zoo hosts the national emblem of China, the Giant Panda. An endangered species native to China, the Giant Panda's diet is over 99% bamboo. It was time to take the train from Beijing to Xi'an. We were taking an overnight train, again booking a "hard sleeper". Learning from my previous overnight train ride, I brought an instant noodle cup with me, so to have something to eat for breakfast (the trains provide hot water, and the locals seem to favour instant noodles for breakfast). The Xi'an Drum Tower got its name from the huge drum located within the building. The drum was beat at sunset to indicate the end of the day. 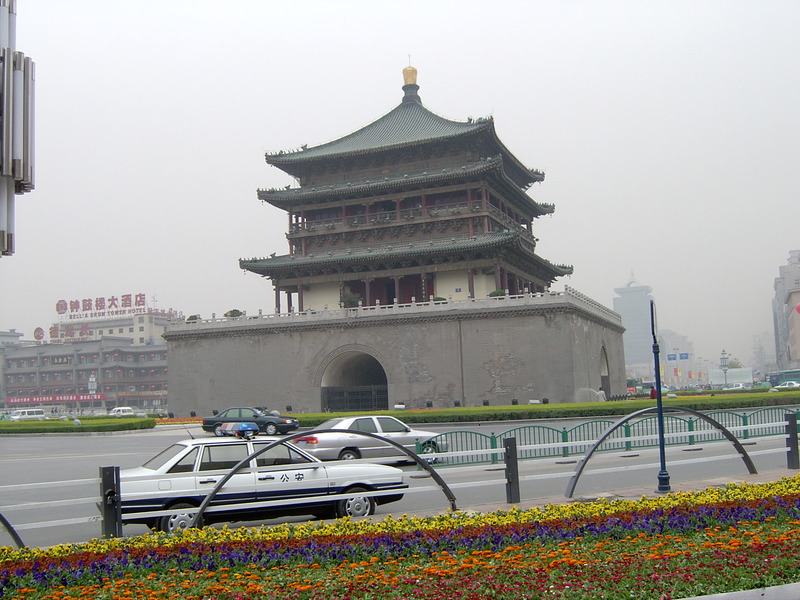 The Xi'an Bell Tower was built in 1384 during the Ming Dynasty, and conatins large cast bronze bells from the Tang Dynasty. The Bell Tower was mainly used for time reporting and publishing news in ancient times. 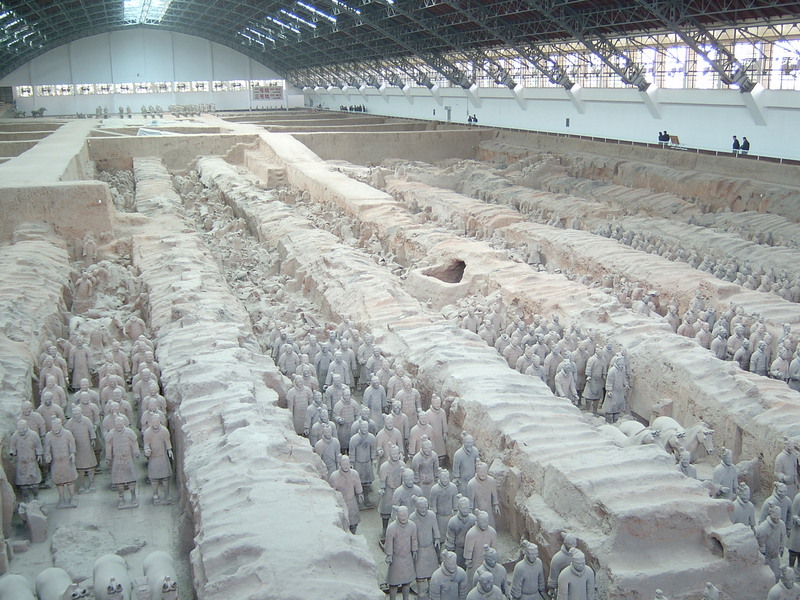 Considered as one of the greatest archeological discoveries of the 20th century, the Terracotta Warriors were an army meant to protect emperor Qin Shi Huang in his afterlife. Construction of the army began in 246 BC, and took approximately 40 years to complete. This is the view from Vault 1; the dimensions are approximately 230m long by 60m wide. They estimate there are some 6,000 terracotta figures of soldiers and horses here in Vault 1, with most of the figures still buried. 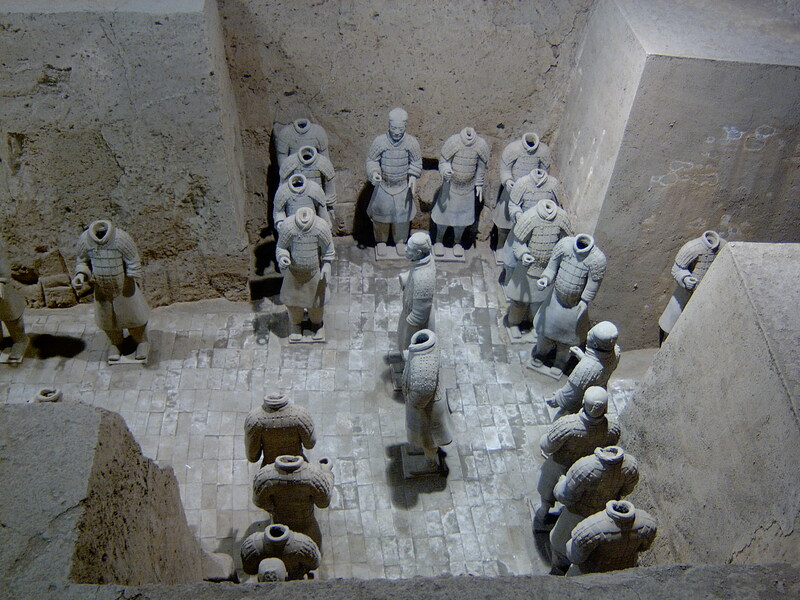 No two Terracotta Warriors are alike; it appears that unique heads, modeled from real persons, were assembled onto a common body of different types of warriors. 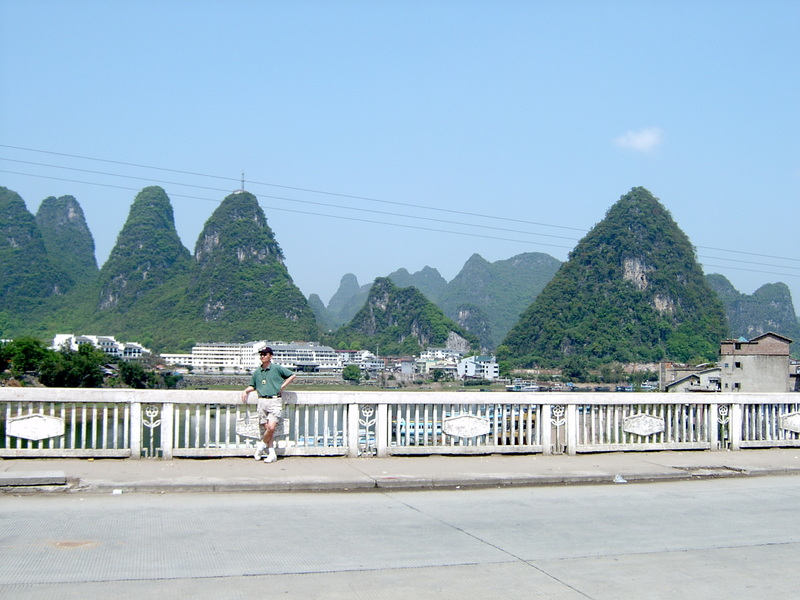 The town of Yangshuo in the background, among the karst mountains that surround it. 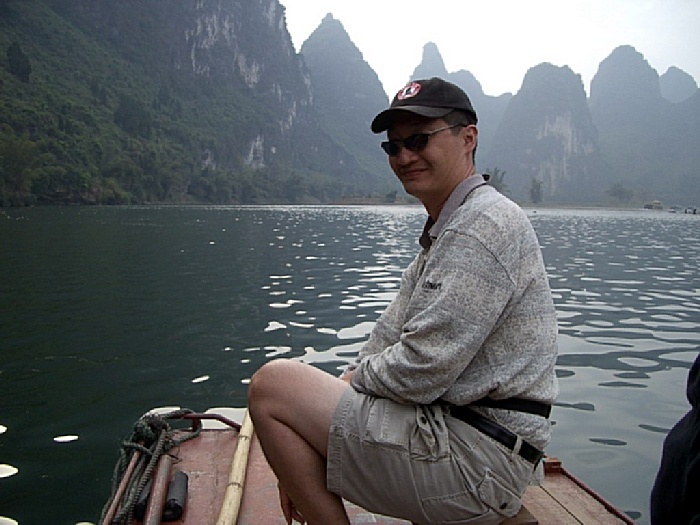 It was a pleasantly mellow and peaceful stay in Yangshuo, after the craziness of the other cities we stayed at in China. 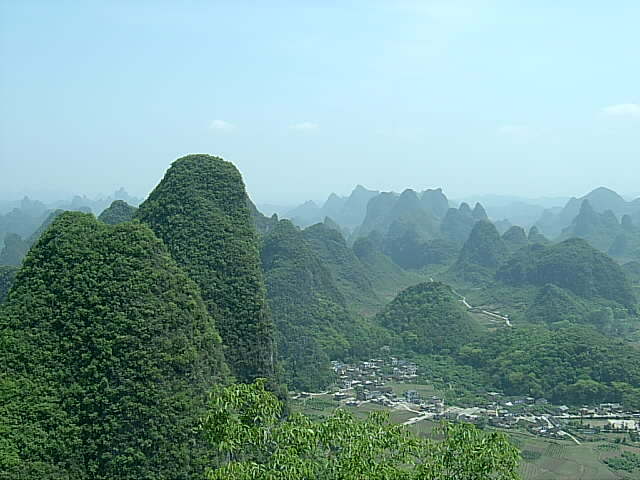 The karst mountains are made of limestone. 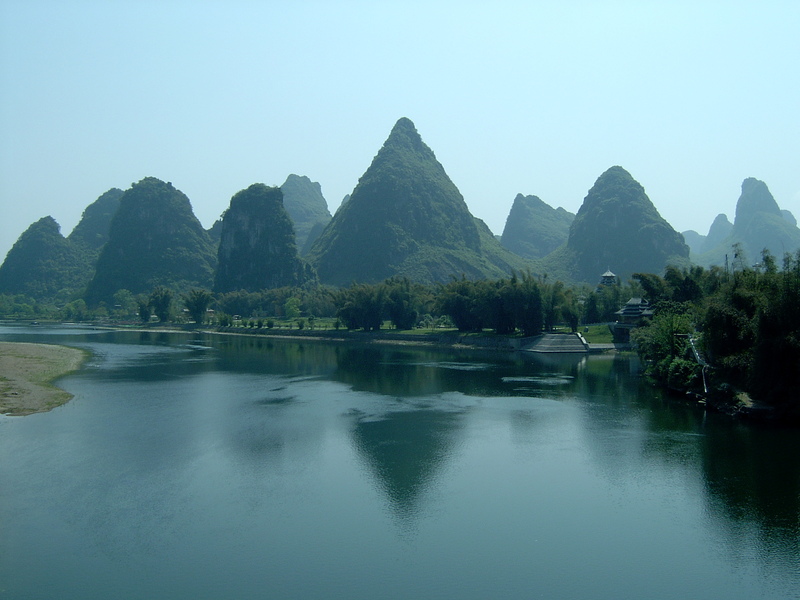 Over millions of years, water erodes away the limestone to form the distinctive "pointy" mountains around Yangshuo. Near Yangshuo is Moon Hill. The natural arch is actually the remains of what was a limestone cave formed by an underground river. 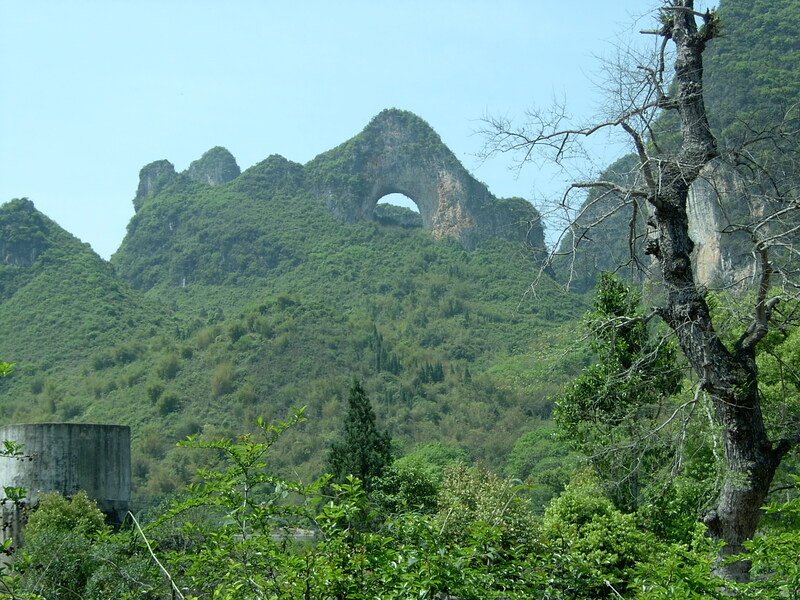 Moon Hill rises 230 meters above the surrounding countryside. 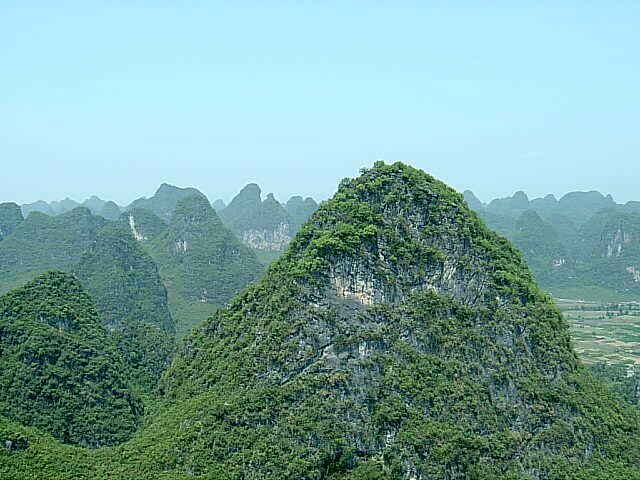 From atop Moon Hill, there are spectacular views of the countryside around Yangshuo. 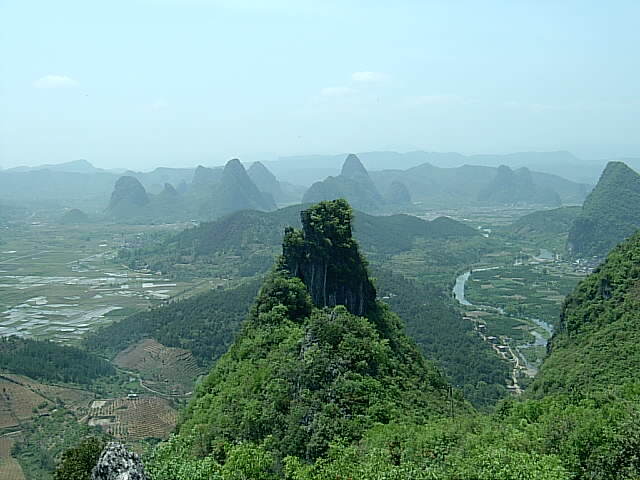 The views of the countless karst hills all around, to the rices fields and the Li River below, the hike to this viewpoint is worth the effort. Truly breathtaking and memorable! We rented bicycles in Yangshuo, and rode the bikes from town to Yangshuo. We rode on roads and through rice fields to get to Moon Hill. The bike ride itself was quite the experience, and I would recommends this form of transport to take in the sights in this area. 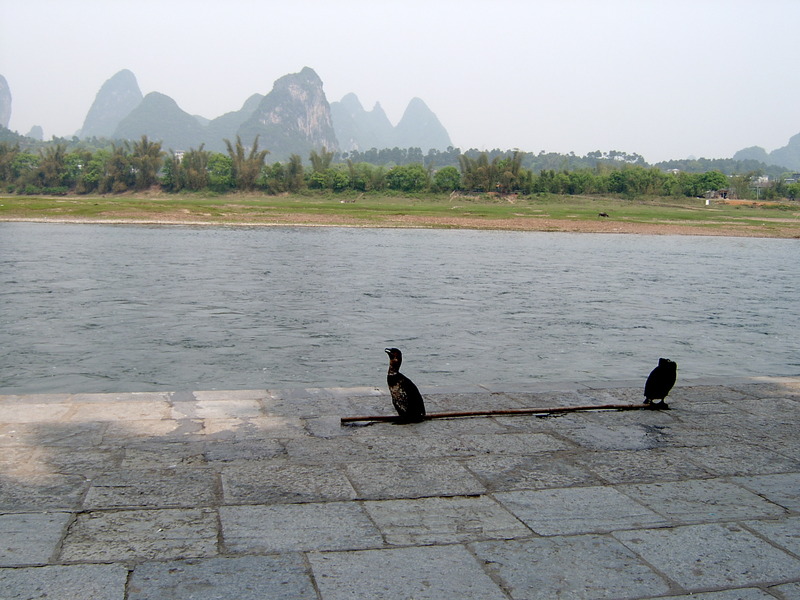 The fisherman in the Yangshuo area use trained cormorant birds for fishing. There is a snare tied around the bird's throat to prevent them from swallowing the fish. 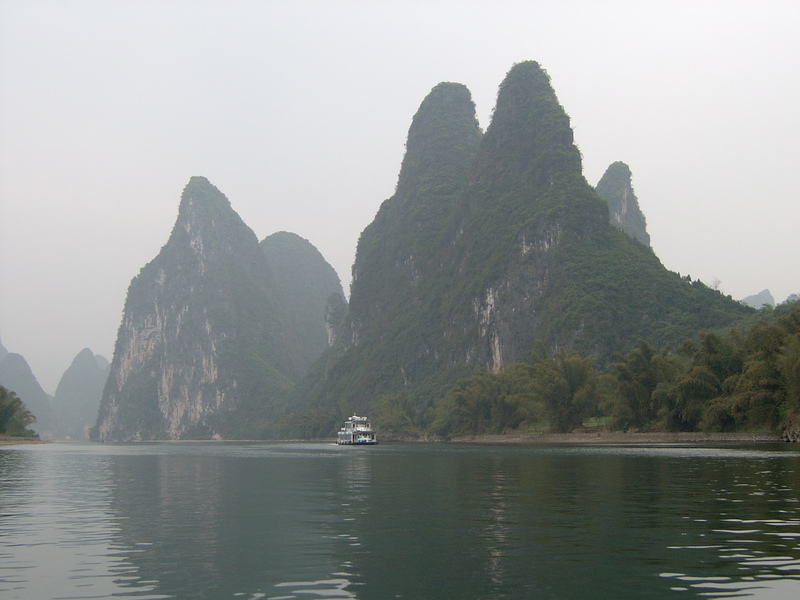 No visit to Yangshuo would be complete without taking a tour of the Li River on a boat. The regular tourists will take a boat cruise on the river, which includes a dinner, but for budget travelers like me, we hired a small fishing boat from the nearby town of Xingping (兴平) to take us on the river, to take in the views of the karst mountains, fisherman with their cormorants, and water buffalo. Here is the view from our boat. In the distance is the regular tourist cruise boat, from the city of Guilin. Behind me is the Nijubashi Bridge (環境省), used to cross the moat to the Tokyo Imperial Palace, the primary residence of the Emperor of Japan. Nijubashi means "double bridge"; this bridge was originally made of wood, but was reconstructed with steel in 1964. I visited the Tokyo National Museum, viewing examples of Samurai armour and katanas (swords). Japanese armour was generally constructed from many small iron and/or leather scales and/or plates, connected to each other by rivets and macramé cords made from leather and/or braided silk, and/or chain armour. The katana is characterized by its distinctive appearance: a curved, single-edged blade with a circular or squared guard and long grip to accommodate two hands. This sword were used by the samurai of ancient and feudal Japan. The Kabuki-za (歌舞伎座) Theatre, located in Ginza, is the principal theater in Tokyo for the traditional kabuki drama form. Kabuki is a classical Japanese dance-drama, known for the stylization of its drama and for the elaborate make-up worn by some of its performers. Although I did not understand a word of what the performers were saying, I got the gist (or maybe not) of what the story was about, based on the acting. My Mom would bug me, saying I should visit China, so I did! 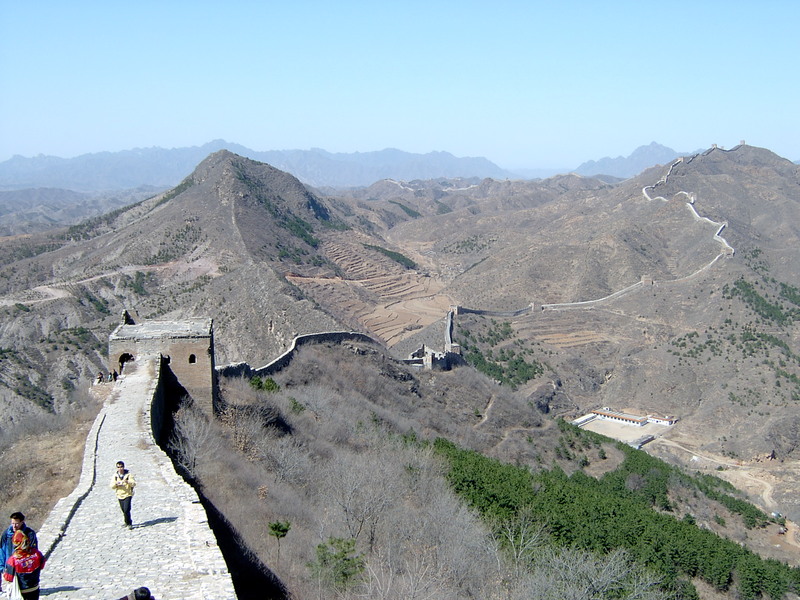 The Great Wall of China was quite amazing and fascinating to behold, and I would strongly recommend a visit to this great example of human construction. Yangshuo, with the it's karst mountains and mellow, slower paced rural lifestyle, was a great place to get away from the craziness of the cities. This was the place to "chill out". Tokyo was quite the contrast to the places I visited in China; it was modern and very organized (versus the chaos of China). This trip really opened my eyes to a world that was different from mine, yet at the same time, very similar. I was suprised how modern things were, and yet, very old. A visit to China and Japan should be on everyone's bucket list.